Last night, I was watching TV with mum and dad. It was some music quiz show, Spicks and Specks. I don't usually watch but this time I thought I would. It was a very tiring show and afterwards, I had to take a nap. I was sleepy! I didn't really want to move from where I was though, so I stayed in front of the TV and had an emergency nap there. It was reasonably comfortable, but mum thought I was mad! If you click on that bottom photo to make it bigger you can see my VERY cute paw pawsition. 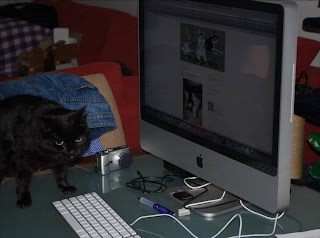 I had meant to show you that I really was sitting at mum's iMac for the whole Day of Blogs with Kat and Steve (except when Wilbur dropped in to play) but I got distracted by the flashy beast yesterday. See, I really was there! Mum says to ignore the mess in the background. All those boxes on the couch are from the new flashy beast, which she hasn't gotten around to throwing out yet. 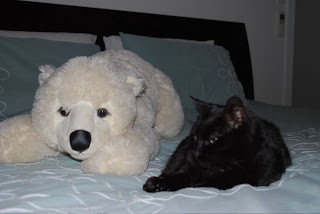 As you know, Polie was sacked as my body guard because he did a bad job. Daisy told him, "You're Fired!" in her best Donald Trump voice. He hasn't spoken to me since, I don't know why. He said that I needed to camouflage myself, like he does out in the garden. I asked him how he hid himself in our pathetic garden, and he asked me if I had ever seen him in there. I said no, of course, because I haven't. He said it was all due to camouflage. So I gave it my best shot next time I saw mum with the flashy beast. This is us sitting outside on my wooden horse plotting the downfall of Salvador. As you may have read in one of Wilbur's posts yesterday, we came up with the plan of spray painting Salvador black so mum would confuse him with me, and then follow him with the flashy beast all the time. It worked really well for about two hours, until Salvador went out in the rain and all the paint washed off him. I knew we should have used the lead-based stuff. So I am back to the drawing board on that one. I also won a stuffed alligator (I hope it tastes like chicken!) and the kitty magnets so I am very excited. My mum offered to stay up with Steve, Kat and Wilbur's mum to keep her company in the middle of the night so they exchanged a lot of emails. I don't know why the mums had to stay awake, it was the pups and kitties doing all the hard work! and then I am going to bed! I'm just sad that my best friend Zimmie couldn't come and visit me too. Perhaps now that Wilbur has done it, Zimmie can too! Purrr S: my nose is a little sore because Meeshka gave me a nose bonk. My friend Suka has given me an award! I'm very honoured. Add the logo of the award to my blog. Done! Add a link to the person who awarded it to me. Done! Nominate at least seven other blogs. Done! Add links to those blogs on my blog. Done! Leave a message for my nominees on their blogs. Done! Thanks Suka, this is a big honour. Now, who to pass this award on to...? Daisy the Curly Cat, one of the funniest animals I've ever met. Holly, she is a new big sister and a very good one! Sitka, Tia and Cornelia Marie, they all get along so well. Star and Jack, the supermodel and the adorable puppyhead! Those pups and kitties all add up to seven so I am done! Rules:* Link to the one who tagged you. * List the rules on your blog. * Tell about 6 unspectacular quirks of yours. I sleep a lot. A LOT. I prefer to sleep in my Huffle bed, or on mum and dad's bed, or on my big bed. I like stinky gravy with my dinner. 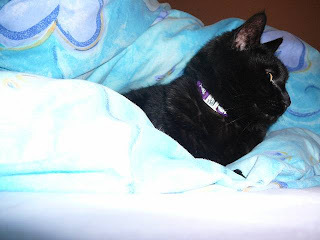 I like to sleep under the blanket when it's cold. I have never climbed up on the kitchen bench, even when no-one is home to see it. Just like Angus, I do not like catnip. I sniff it and walk away. 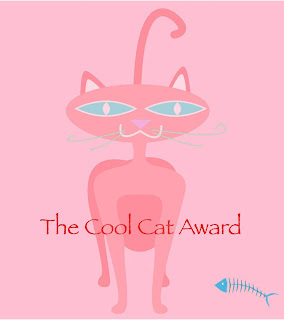 My friend Witty Kitty awarded me the Cool Cat Award! I'm very proud. Thanks, Witty! Since I get to pass it on to another five kitties and pups, I'd like to share this with my friend Suka, who is a bit depressed about the weather, Simcha, who has been feeling a bit poorly lately, Grreta, who is just new to blogging, Mr Hendrix, because he is cool, and Ari, because she has such great adventures and isn't scared of snakes. Last night I was taking some time out to squash mum by sitting on her chest. 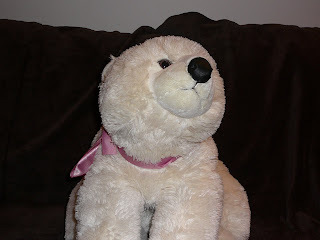 Someone (obviously it wasn't mum since I was sitting on her) got out the new flashy beast and took a photo. And where was Polie in all of this? Fast asleep in the couch. Even more frightening, look at what mum is wearing. Sleepy pants! How embarrassing!!! Grrreta had a great suggestion for Polie yesterday. She said he'd be more bodyguard-like if he had dark glasses on. Well, we tried that and had no success. See? Maybe it would have been better if I didn't steal mum's designer sunglasses to give Polie. So I have hired Polie to be my bodyguard. It's his job to protect me from the pupparazzi and the giant flashy thing that has moved into our house. 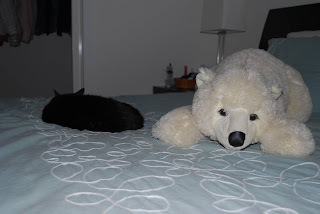 Yesterday, I was taking a nap on mum and dad's bed and Polie was supposed to watch over me. He's not very good, is he? He is supposed to chase away the pupparazzi or put his giant paw in their faces to stop them taking photos... and look what happens. I think he was sleeping on the job! Does anyone know any good bodyguard training courses? See that thing on the bottom left paw corner? That's the flashy thing. You won't believe the torture I've had to endure already. Polie better learn to protect me from the pupparazzi pretty quick! When you are an explorer cat, you have a very busy life. Take yesterday, for example. This is the shower in the bathroom that nobody really uses. Mum opened the door and I had to go straight in to explore. You never know what you might find! It could be completely different to the shower in mum and dad's bathroom. 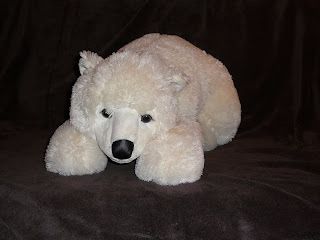 I am thinking of training the polar bear featured yesterday to be my body guard. I have named him Polie. Perhaps he can protect me from the pupparazzi. 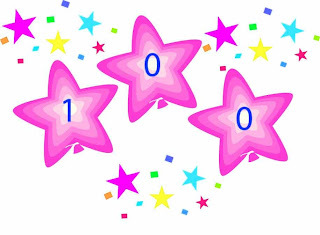 Today is my 100th post! I can't believe I made it into triple figures. Mum is amazed that I have stayed focused for so long. But I love blogging. 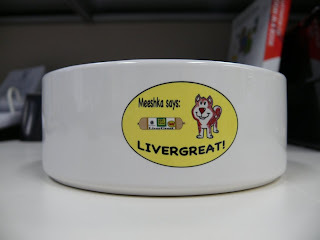 This weekend I think we should celebrate with a pawty. I will have mum make some pupcakes and stinky treats and we can all celebrate! For those of you who don't know, a doona is like a duvet or comforter. Toasty and cosy. Perfect for winter weather like we have at the moment. So when it's nice and cold out, you have to make sure that someone has not smoothed out the doona on your bed so you can make a proper sleeping spot. This is my doona on my bed, not mum and dad's. I would like to mention to Wilbur that my sitting on mum for a lot of Tuesday obviously helped, she went to work on Wednesday with no problems. And she probably did have whatever your mum had. There are no new photos for my blog today! That's because I was sneaky last night when mum was pointing the flashy thing at me - every time I saw it I turned around. I was being a telly show cat, sitting up in front of the telly, and having a look at the picture of mum's dog Max in the frame next to the telly. But there is no photographic evidence! Also, yesterday mum wasn't feeling very well so she came home from work and sat on the couch with me for hours! We got out the toasty couch blankets and sat under them and watched telly. 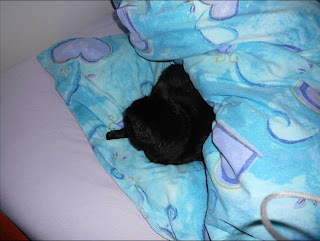 I was under the blanket as well, purring. It was about 10pm when I decided to be a telly show cat and mum got the camera out but we know that didn't work out for her. Why are you pointing the flashy thing at me? I'm just trying to come downstairs without being harassed by the puparazzi! I'm outta here, I've had enough! It's not my fault. I was just sitting in the sun and she surprised me. Mum is very pleased with herself! Hey pups and kitties. Not much going around here today. It's cold so I'm staying inside in my Huffle bed. Actually, I'm having a nap in the anticipation of Sitka and Tia's big adventure. I can't wait to see the photos! I saw that a certain someone had to have a bath (*ugh*) yesterday in honour of the occasion. I'm glad mum doesn't do that to me! I'd also like to wish a happy birthday to my friend Mickey. 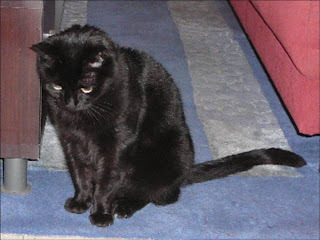 He's a black cat just like me and he turned 15 yesterday. 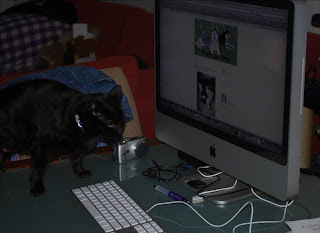 Purrr S: if you don't want to know what Sitka and Tia's surprise is, don't click on the links! Yesterday my mum and I had a very interesting conversation with Khyra and her mum. It turns out that grapes (and sultanas, and raisins) are very bad for pups and can cause nasty things to happen. So, don't eat them! Post them all to Salvador. If you want to read more about bad food for pups (and probably kitties as well), click here! 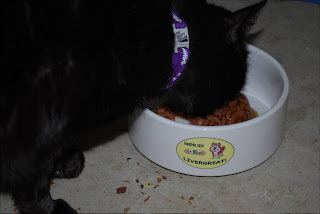 The perfect bowl from which to eat stinky goodness! HM: What is your real name? Is it something other than “mum”? Mum: My name is Tracey… but you can call me mum. HM: What do you do all day when I’m left home alone? Mum: Dad and I go to work so we can afford your stinky cat food and all those mouses you love playing with. HM: Hmmm… where is this “work”? Can I come too? Mum: I work for the Victorian Government – if I worked at Google I’d take you to work but you’ll just have to stay home for now. HM: What about dad? Does he go to this “work” with you? Mum: Well, we travel together but he works in a different place. HM: Can I go there with him? Mum: You’ll have to ask him! But remember you don’t like travelling in the car. HM: Oh yeah, I forgot about that. Why is Salvador so mean to me? Mum: He’s old and grumpy. And he has dementia. He’s nearly 16 now so I think he finds your 7-year-old energy levels a bit much. Just stay out of his way and he’ll leave you alone. HM: Why don’t I get more new mouses? Mum: You don’t play with all the ones you do have! How many more do you want? HM: That’s beside the point. I should get new toys all the time. Other cats do *sniff*. HM: Never mind. So what do you and dad do for fun? 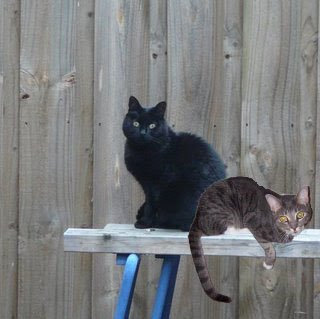 Mum: We don’t have time for fun – we have to keep you and Salvador in food and mouses. We like to go out for dinner to nice places, and we like going on holidays. HM: What’s that all about? You keep going away and leaving me here! Mum: But we don’t leave you alone – your aunt comes to look after you. And I’ll bet she feeds you more than dad does. HM: Well... that's not important right now. Are you going to get me a puppy to play with soon? Mum: Probably not for a few years. We don't have the room. And I don't think you'd like to share with a puppy. You might lose a bit of space on our bed. Which reminds me, I have a question for you! HM: Really? But this is me interviewing you. Mum: It's just a short one. How does one small black cat take up so much space on a king sized bed? So there you go! One day I will try and interview dad but he's a bit shy. Hi every kitty and pup! What do you think of the new look for my blog? Mum and I played around with about 10 different looks but I think I like this one the best. 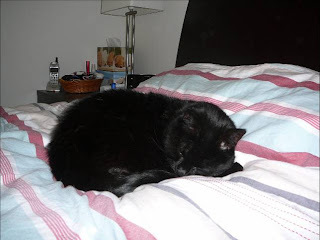 As I mentioned yesterday, Wilbur and I have been talking about an activity for the Cat Pack. I think this could be a good one, if everyone is interested. We have noticed that there was an international gift exchange organised by some pups a while back, but no kitties were involved (that we know of, anyway). So we thought the Cat Pack could do their own international gift exchange! With a limit on how much you have to spend, of course. I'm thinking some time around the end of August, to celebrate the end of the summer for most of you, and the end of winter for me (and anyone else in the southern hemisphere). What do you think? Leave me a comment or email me and tell me your opinion. All kitties and pups in the Cat Pack are welcome to play (and if you want to join the Cat Pack in the meantime, let me know). Mum never learns. I don't like to pose for photos unless I'm in the mood. I learned very good lessons about that from my teacher at the SZK School of Siberian Studies. I was sitting on the rug, minding my own business, when the flashy thing went off. 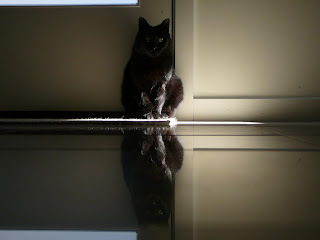 Because I am a black cat, I have very fast reflexes. I quickly looked down so mum wouldn't get a proper picture of me looking at her. HA! Wilbur and I have been talking about activities for the Cat Pack. I'll talk about a possible one tomorrow. My friend Parker gave me an award! I'm a sweet home blogger! I hope everyone has the tune to Sweet Home Alabama running through their head now, coz that's what mum says is happening to her. Thanks Parker, this is a lovely honour. Now to answer a few questions about yesterday's post. I'm not saying I "did" put my tail in mum's coffee and I'm not saying I "didn't" do it either. Let's just say that mum did find a black hair in her coffee. And dad says thanks for all the compliments about the actual photo, since he was the one who took that. Usually I only pose for mum so he felt quite lucky! And Steve, yes that is a puppy on the cup. Mum used to have a rottweiler named Maxine, so when she saw that cup she had to buy it because it reminded her of Maxine when she was just a pup. Today I'll be basking in the glory of my great coffee victory. And that means mum and I have coffee in bed. Yay! Mum and dad didn't want to get up this morning. Something about it being cold outside and they were both tired... blah blah blah. I got out of bed first. Then I huffed around in their bathroom for a bit so they got up to see what I was doing. Gets 'em every time! This is me on my way back to bed this morning... I did mention it's a bit cold out, right? I wonder if Dave and Hollybbb will get married now? I can be the flower cat at their wedding! That would be so much fun. I guess Uncle Buckley will have to stay a single dog for a while longer. My friend Turbo has been having seizures. This isn't good. When he is President he will ban them completely and then no-one will have to worry. I don't think I've ever had a seizure but mum says I am mental anyway - does anyone know what she means? It's cold again today. I was an explorer cat outside this morning but then my paws got chilly so I had to come back inside. Before that, I was purring under the doona and dad was patting me. What more could a little black cat want? Last night I hissed at and tried to bite mum because I was trying to walk all over the bed and she held on to one of my paws. I let her know that this is not acceptable behaviour. I don't think she'll try it again. I heard a rumour that my best pup-bud's brother Dave is getting a special visitor today. Hollybbb, if you decide you don't like Dave that much because his ears aren't straight or his collar isn't on right, I will introduce you to Uncle Buckley. But honestly, I can't see that happening. Dave is cool (obviously not as cool as Zim, but who could be?). Can't wait to see the photos from that meeting! Today it's raining at home. I don't like the rain, it makes my furs all wet and yucky. So I am inside where it's dry and warm. I have noticed that the war between Wilbur and Khyra is escalating. Wilbur, if you need to leave the country in a hurry, just come and stay with me. Maybe we can gang up on Salvador and send him packing. Mum and dad went to visit my Uncle Buckley on the weekend. It's part of the reason they left me alone for two nights in a row. Uncle Buckley is Grandpa's dog. 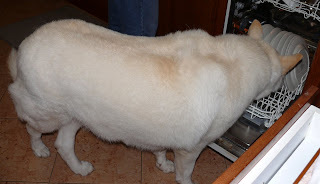 He is a White Swiss Shepherd dog. 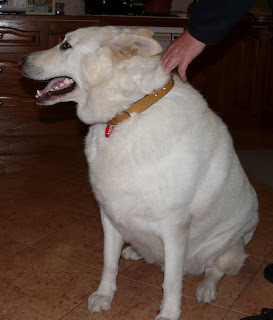 Last time I talked about him, he had been to the v-e-t because it was time for his injections and they told my Grandpa he needed to go on a diet because he weighed 64.8kg. That's 142lbs. I don't think Queen Meeshka needs to worry. I think he might have secretly been attending Stormy's class on posing for photos because he wouldn't sit properly for mum when she had the camera out. Every photo we downloaded was of his tail or his back or him looking away. He's a very helpful pup! Mum always calls him the polar bear because he's big and white. And he has big teeth. Like a polar bear.